Although vitamin C is "only" an antioxidant, its unique chemical structure, closely resembling glucose, allowing it to penetrate all of the water-soluble areas and tissues of the body, both inside cells and outside cells. It only really fails to concentrate in fatty areas, although it can still have an antioxidant impact there, as it will regenerate fat-soluble antioxidants, such as oxidized vitamin E, back to its normal electron-donating status. All non-malignant cells in the body require vitamin C to fuel their metabolic activity. In fact, vitamin C can very much be considered the fuel on which cells run. Even inside the cells, where the antioxidant glutathione plays a prominent role in cell function, vitamin C is needed to keep the glutathione in its active, electron-donating state. Other antioxidants can help vitamin C perform its function, but when it is severely depleted, disease is always present. The design of nature is incredibly elegant. While vitamin C improves the health of normal cells, it increases the oxidative stress inside malignant cells. This is because all cancer cells accumulate iron and hydrogen peroxide, and the vitamin C can generate highly reactive hydroxyl radicals via the Fenton reaction that can kill the cell when it is sufficiently activated. Normal cells have only relatively little iron and next to no hydrogen peroxide, and vitamin C cannot increase oxidative stress in these cells. Actually, in normal cells the only effect of vitamin C is decreased oxidative stress. As an added point, when enough vitamin C is chronically present inside cells, they cannot accumulate iron and hydrogen peroxide, and they are unable to become malignant in the first place. Chemotherapy kills all cells, but just kills cancer cells more effectively. This is why chemotherapy has such horrible side effects, as it gets into normal cells as well as the cancer cells. All cancer cells already have a state of increased intracellular oxidative stress, so the additional pro-oxidant effects of highly toxic chemotherapeutic agents can push this elevated oxidative stress to the point of causing cell death. Some normal cells are killed as well when enough chemo is given, but for the most part the chemo just elevates the intracellular oxidative stress of normal cells to point of disrupting their normal metabolism and making them sick. If you are reluctant to treat your cancer with only vitamin C, definitely take it as well as your chemotherapy. The way information is presented to the public makes it relatively rare to find someone who doesn't want anything to do with chemo. Most want to "cover all bases" and take chemo along with whatever else they can find that they think will be good, including vitamin C.
This approach can work well for many people who simply don't have the strength needed to defy the advice of their physicians. Many cancer patients are simply beaten down mentally and physically, and they simply do not have the capacity to do anything but put their faith in their docs, even if they strongly suspect how they get treated will not give them the best results. Vitamin C will neutralize any toxic chemo drug if it encounters it directly in the blood, just as though it was snake venom or any other blood-borne toxin. However, when the C is given before the chemo, and additionally several hours after the chemo, it does nothing but help. Vitamin C increases the oxidative stress further inside the cancer cells along with the chemo and increases cancer cell killing, while it helps repair the damage done by the chemo to the normal cells. 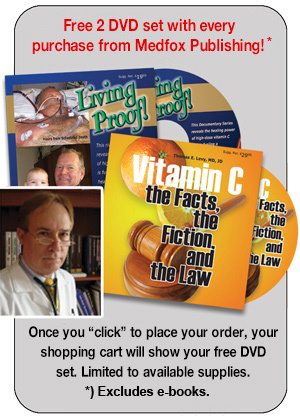 Many cases of cancer resolution from vitamin C are documented in the literature. Generally, the best effects will be obtained by infusions of 50 grams or more intravenously, along with oral liposome-encapsulated vitamin C, several grams a day. As discussed in other articles, many cancer patients will not improve, or hold their improvements, if they do not address dental infections, especially root canals, as part of their treatment protocol.